Hispanics are positive about the census. Seven-in-ten (70%) say the census is good for the Hispanic community, while 23% say it doesn’t make much difference for the Hispanic community. Just 2% say the census is bad for the Hispanic community. 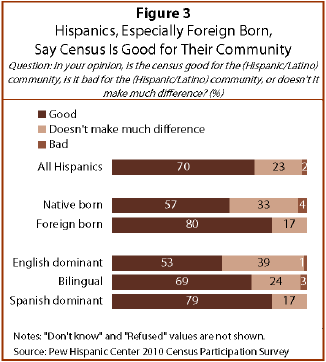 Views of the census are more positive among foreign-born Latinos than native-born Hispanics. Fully 80% of immigrant Hispanics says the census is good for the Hispanic community, while 57% of the native born hold the same opinion. Language usage patterns are also related to the views of the census among Latinos. Nearly eight-in-ten (79%) Spanish-dominant Latinos say the census is good for the Latino community, while 69% of bilingual Latinos and 53% of English-dominant Latinos say the same. Those who say the census is good for the Hispanic community, were asked why they felt this way. In response to this open-ended question, 46% said “so everyone can be counted,” 32% said the census “benefits/helps the community, city, state, and/or country,” and 10% said the census “helps with school funding.” The same question was asked of those who said the census is bad for the Hispanic community, but since so few survey respondents say this, their responses are not shown.